Book Cover: "After nursing a broken engagement with Jane Austen novels and Absolut, Courtney Stone wakes up and finds herself not in her Los Angeles bedroom or even in her own body, but inside the bedchamber of a woman in Regency England. 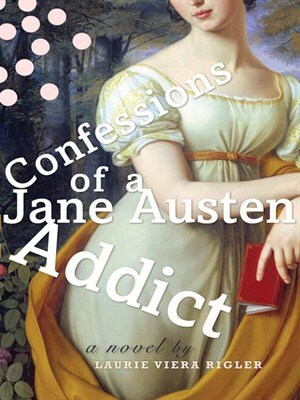 Who but an Austen addict like herself could concoct such a fantasy? Not only is Courtney stuck in another woman's life, she is forced to pretend she actually is that woman; and despite knowing nothing about her, she manages to fool even the most astute observer. But not even her level of Austen mania has prepared Courtney for the chamber pots and filthy coaching inns of nineteenth-century England, let alone the realities of being a single woman who must fend off suffocating chaperones, condomless seducers, and marriages of convenience. This looking-glass Austen world is not without its charms, however. There are journeys to Bath and London, balls in the Assembly Rooms, and the enigmatic Mr. Edgeworth, who may not be a familiar species of philanderer after all. But when Courtney's borrowed brain serves up memories that are not her own, the ultimate identity crisis ensues. Will she ever get her real life back, and does she even want to?" Taryn's Review: While I was at the library searching for books, I was distracted by some heavy personal issues that had been bothering me. As I looked at the many books lining the shelves, it hit me that I needed something fun to read to escape my sadness. I wanted a book where I didn't have to think too deeply; a book that could get me safely entranced in its story so I could evade my own surroundings for a bit. Among the crammed shelves, this book popped out at me and into my bag it went. The book was just what I needed. It isn't particularly amazing. The writing itself isn't that fantastic. The book has storyline flaws. But it was fun to read. Imagine if you woke up in the setting of your own favorite books. How would I react if I woke up in a bedroom of Tara Plantation from Gone with the Wind? Would I be able to fit in if I found myself living in a shanty house in war-torn Afghanistan like in A Thousand Splendid Suns? That's the charm of the book that kept me entertained: a 20-something Los Angeles woman parading around 1813 England, laughing in her mind at the shocking difference between the two worlds. At times, Courtney made me laugh when she explained how she'd deal with each issue if she were back in the 21st century. The book was simple and didn't develop too deeply beyond what's going on in Courtney's head. Courtney (aka Jane Mansfield) had to realize how her actions in this time period not only affected her, but her family and friends. It was very convenient that Courtney could selectively have some memories of Jane's life at hand (like embroidering and dancing), but had to wait as Jane's memory only gave her small clues at a time. Courtney had to be patient to learn about the mysterious Mr. Edgeworth. Courtney also struggled since she had no memory of Jane's friend Mary, Jane's mother and father, and more. Overall, the book is not a classic book nor a deep, thought-provoking book. But it's fun, and it's a great escape when you need a break from the 21st century yourself! I recently read this book, and agree it was a great escape! I love reading your blog and finding out about new books for me to read!